Tea drinking, which originated deep in the mountains of Asia, spread to every corner of the world over the course of several thousand years. There were two main stages in this process of dissemination. The first took place from the 8th century to the 9th century when it spread to China's neighbouring countries against the background of the glorious culture of the Tang Dynasty (618-907). Japan and the Korean peninsular and also Central Asia began drinking tea at this time. This was how the custom of drinking tea became established in Asia. The second stage was from the 15th to the 17th centuries, the time of the great age of ocean navigation, when Europeans discovered new sea routes and continents, leading to the encounter of eastern and western cultures, and then on into the following age. The culture of tea, which until that time had been confined to Asia, now spread to Western Europe. Particularly after the end of the 18th century, when England had colonies throughout the world, tea spread among the colonial people as part of English culture. As the industrial revolution enabled countries to modernize, various drinks containing caffeine became very popular. Tea was one of these, with Britain being the centre of the black tea drinking zone, and China the centre of the green tea drinking zone. There was also oolong tea and so on, so that various types of tea came to be drunk all over the world. 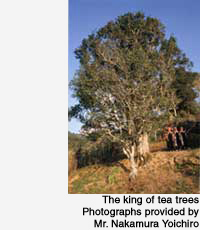 During this long history of tea, the area that has consistently maintained a culture of tea drinking is Asia. Japan in particular has kept up the old style of drinking tea from the 11th century to the present day. That is to say, the drinking of matcha (powdered green tea). Various other kinds of tea are also enjoyed in Japan and it is one of the special characteristics of Japanese culture that the most traditional kind of thing exists along with the most modern.